Recently, the United States Government announced several new tariff increases. The U.S. Department of Commerce implemented tariffs on steel and aluminum imports for national security reasons. Separately, the U.S. Trade Representative (USTR) announced tariffs to combat unfair trade practices on certain Chinese goods. Additional tariffs on a larger list of goods from China are expected in the future. Small businesses should become familiar with what imported products are impacted, to make informed business decisions as tariffs could increase the total cost of certain imported goods. ° USTR implemented a process by which U.S. stakeholders may request that imported products be excluded from these newly implemented duties on Chinese goods. USTR will evaluate each request on a case-by-case basis. ° USTR has published on USTR.gov a request form template, Q&A, instructions on how to describe your product, and how to request an exclusion before October 9, 2018 at https://ustr.gov/issue-areas/enforcement/section-301-investigations/request-exclusion. ° If you have questions about the product exclusion process for tariffs found in 83 FR 28710, you may directly contact Arthur Tsao or Justin Hoffmann at 202-395–5725 at USTR. ° For questions on customs classification or how the additional duties will be assessed, please contact Traderemedy@cbp.dhs.gov. ° A list of goods with additional tariffs of 25% to be collected starting August 23, 2018 is available on the USTR.gov website under press releases. (https://ustr.gov/about-us/policy-offices/press-office/press-releases/2018/august/ustr-finalizes-second-tranche). ° A list of approximately $200 billion worth of Chinese imports will be subject to additional tariffs starting September 24, 2018, and initially will be in the amount of 10 percent. Starting January 1, 2019, the level of these additional tariffs will increase to 25 percent. The White House announcement on this action states: “if China takes retaliatory action against our farmers or other industries, we will immediately pursue phase three, which is tariffs on approximately $267 billion of additional imports.” The USTR announcement and Third Tranche list are available at https://ustr.gov/about-us/policy-offices/press-office/press-releases/2018/september/ustr-finalizes-tariffs-200. The White House statement is available at https://www.whitehouse.gov/briefings-statements/statement-from-the-president-4/. ° The United States has imposed tariffs on steel and aluminum imports under Section 232 of the Trade Expansion Act of 1962, as amended. ° Information on the Department of Commerce exclusion application and objection process can be found on the Bureau of Industry and Security websites at https://www.bis.doc.gov/232-steel and https://www.bis.doc.gov/232-aluminum. ° Questions regarding steel exclusion requests can be addressed to the U.S. Department of Commerce at 202-482-5642 or Steel232@bis.doc.gov. ° Questions regarding aluminum exclusions requests can be directed to 202-482-4757 or Aluminum232@bis.doc.gov. ° Information on foreign government response and goods impacted can be found at https://www.trade.gov/mas/ian/tradedisputes-enforcement/retaliations/tg_ian_002094.asp. • Some impacted goods may also be subject to anti-dumping (AD) or countervailing duties (CVD) duties for unfair trade actions involving selling at less than fair value and prohibited government support. Small businesses importing goods with additional duties related to an AD/CVD investigation should be aware that the estimated AD/CVD duties paid during an investigation can increase significantly and a bill may follow after the goods clear U.S. Customs. Small businesses may direct questions on specific tariff lines and AD/CVD duties to the U.S. Department of Commerce’s Enforcement & Compliance Communications at 202-482-0063. • Small businesses may be eligible for cost-sharing programs under Trade Adjustment Assistance for Firms to retain consultants or industry-specific experts to improve their business competitiveness: http://www.taacenters.org/. 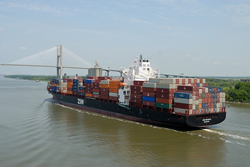 • NIST’s ExporTech program helps small businesses develop strategic export growth plans to enter new markets, https://www.nist.gov/exportech; and visit Export.gov to find your local U.S. Export Assistance Center and trade resources. (https://www.export.gov/Contact-Us). • Local SBA resources can provide business, financial, and marketing counseling and mentoring to help strengthen your business, navigate trade challenges, and connect to Federal, State and Local resources including competitive STEP grants when available: www.sba.gov/local-assistance. • SBA Trade Finance Managers can educate on SBA’s loan guarantee programs and trade finance options and what information you need to approach a bank effectively: https://www.sba.gov/article/2017/nov/01/list-useacs-sba-staff-2017. • Monitor www.usda.gov press releases for information on USDA’s announcement available at https://www.fas.usda.gov/newsroom/usda-assists-farmers-impacted-unjustified-retaliation. • (9/18/18 UPDATE): Small business farmers and ranchers can learn more about USDA Trade Retaliation Mitigation programs at https://www.farmers.gov/manage/trm and https://www.usda.gov/media/press-releases/2018/08/27/usda-announces-details-assistance-farmers-impacted-unjustified. • (9/18/18 UPDATE): U.S. Customs and Border Patrol “Section 301 Trade Remedies Frequently Asked Questions” are available at https://www.cbp.gov/trade/programs-administration/entry-summary/section-301-trade-remedies/faqs. • (9/18/18 UPDATE): The Federal Government is starting the process to develop a new 3-year Joint Strategic Plan on Intellectual Property Enforcement. By committing to common goals, the U.S. Government will more effectively and efficiently promote and protect our intellectual property. The Executive Office of the President Office of the U.S. Intellectual Property Enforcement Coordinator invites public input and participation in shaping the Administration’s intellectual property enforcement strategy. Submissions must be received on or before November 13, 2018, at 5 p.m. For more information and to submit a comment, visit https://www.regulations.gov/document?D=OMB_FRDOC_0001-0233. SBA’s Office of International Trade believes there is no wrong door for U.S. small business traders. Contact us today at international@sba.gov or 855-722-4877. About the Author: Peter J. Cazamias serves as the Associate Administrator for SBA’s Office of International Trade. This article was originally published on SBA.gov.